1. It looks better and my eyes respond in a more direct way that enables my brain to extract more information from what I’m looking at. 2. Projected light masks surface reflections that distort and distract. 3. The art is the source of the light (some deep meaning here that could fill volumes). 4. More detail (resolution) equals “more real”. I enjoy experiencing “the real” as I feel a direct connection with what I’m viewing. That emotional component is special in my opinion. 5. So much resolution is lost prior to finally getting to the brain. Start with more resolution and you have more to process, once it gets to the brain. 6. HR/PL presents with importance and generates conscious awareness from what would otherwise reside in the subconscious. 7. If the artwork is the light source, it is self contained in a way that does not degrade because of its surroundings. 8. 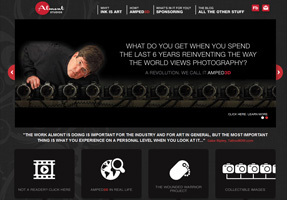 Sharper and brighter vs. blurry and duller? Which do you pick? 9. In my opinion, it is always preferable to be able to look closer and perceive more detail. 10. All living things generate heat, which is light, albeit outside the range of what is generally thought to be perceived by the receptors on the retina and transferred to the visual cortex. However, to me there is something special in the notion that living things emit light whether our retina’s can perceive it or not. In my opinion, we do perceive it in some fashion. I “see” something fundamentally different when I look at something alive vs. something dead. For me, projected light infers life and purly reflected light… well, not so much. I also think that projected light infers reality whereas reflected light infers referential experience. Of course, there are exceptions – but in general, I think that humans respond to imagery with high resolution / projected light in a way that is “more real”. Why “Enhanced Viewing Experience” is the wrong way to think about 3D. In my opinion, there is something fundamentally wrong about the way “3D” is being characterized by those in the know. For the most part, the arguments by the proponents of 3D say it is the same as when sound or color were added to motion pictures. They like to talk about enhancing the viewing experience. One of the ways we know we are perceiving “reality” is that we are able to percieve what we are looking at as occupying physical space. That tells us it is real. Cavemen weren’t confused looking at drawings on a wall as to whether they were real or not. They understood the drawings were representative of something real. The same can be said of all imagery since those first drawings were made. Paintings, drawings, photographs and motion pictures have all been perceived as referential. We watch them knowing we need to interpret what they represent as compared to perceiving what we see as experiencing something real. An exception to the above is when we see and perceive physical space at a Broadway show. But the context of the event makes it clear to our perceptions that we need to interpret what we are seeing as opposed to experiencing reality as it unfolds. Technology is making it possible to blur the distinction between what we should perceive as referential imagery and what we should experience as reality. That is something new and different. It goes far beyond “enhancement”. That’s because we are monkeying around with human perception of reality and asking the brain to weave in and out of referential and real perceptions. For me, it is easy to understand why some people feel discomfort when they are presented with a stream of perception conflicts. With the above in mind, it is my hope that an analysis of my images at CalTech will reveal brain processing pathways that are different for images with depth as compared to single perspective images. My hope is that fMRI imaging will show different parts of the brain lighting up for things presented in stereovision. And then to understand what that information means. 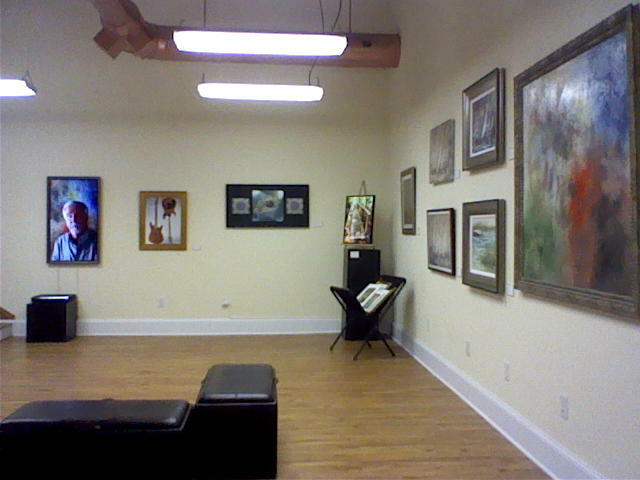 Now Open: Stone Mill Art Gallery! Finally open, yea! I decided to open this art gallery as a location to showcase collaborations between myself and other artists. Since I have spent so much time setting up a state-of-the-art printing facility, I decided to offer some of its benefits to artists to create simply amazing giclée prints. My Barbierie spectrophotometer linked to the Ergosoft RIP and Epson printers offers (to my eyes anyway) the best print quality I have ever seen from an inkjet. Other great news includes a new engraved cast lens material that makes it possible for me to create the best lenticular images I have ever seen anywhere. The culmination of years of experimenting has finally paid off. So, the gallery will be a great place to showcase this amazing new combination of things that has resulted in AMPED 3D photographs with brilliant clarity and depth. Please come! That image on the left is my version of the Harry Potter “come alive” portrait where artist Jim Plesh talks about his art and philosophy.